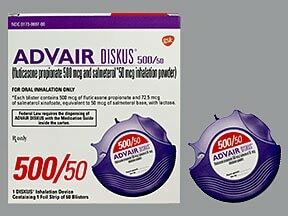 What conditions does Advair Diskus Blister, With Inhalation Device treat? 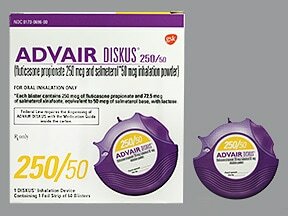 List Advair Diskus Blister, With Inhalation Device side effects by likelihood and severity. Before using this medication, tell your doctor or pharmacist your medical history, especially of: current/past infections (such as tuberculosis, herpes), high blood pressure, bone loss (osteoporosis), heart disease (such as chest pain, heart attack, irregular heartbeat), overactive thyroid (hyperthyroidism), diabetes, eye problems (such as cataracts, glaucoma), seizures, liver disease. What should I know regarding pregnancy, nursing and administering Advair Diskus Blister, With Inhalation Device to children or the elderly? 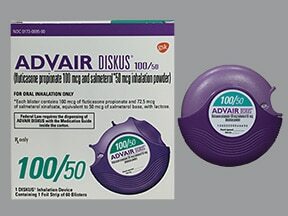 Does Advair Diskus Blister, With Inhalation Device interact with other medications? Do not flush medications down the toilet or pour them into a drain unless instructed to do so. Properly discard this product when it is expired or no longer needed. Consult your pharmacist or local waste disposal company for more details.Information last revised January 2019. 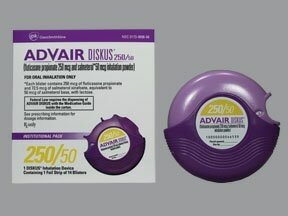 Copyright(c) 2019 First Databank, Inc.
Are you taking Advair Diskus Blister, With Inhalation Device? 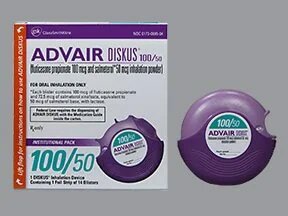 Are you considering switching to Advair Diskus Blister, With Inhalation Device? 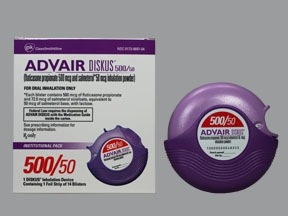 How long have you been taking Advair Diskus Blister, With Inhalation Device?